31 entries categorized "Being an artist"
I keep several quotes posted on the wall above my closet doorway in my studio, so I see them whenever I look up from my worktable. The first quote is from Grandma, in the Family Circus cartoon. "If you're afraid of making a mistake, you won't make anything." I like this quote because it reminds me that it is easy to freeze up, thinking that evrything I make has to be absolutely perfect. I often learn a lot from my mistakes and sometimes the lack of perfection is what makes the artwork extra special. The second quote is from Jean Cocteau, the writer and filmmaker. "How do you become a successful artist? Amaze me!" When I read this, it reminds me that it's difficult to gain recognition as an artist and my artwork needs to have the "wow factor" in order to make my work stand out. The third quote, which is my favorite, comes from Jerry Garcia, the guitarist from The Grateful Dead rock band. I changed the quote a bit because the original was written from the standpoint of a band with multiple members. Here's my version. "You do not want to be considered just the best of the best. 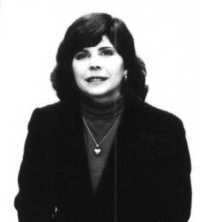 You want to be considered the only one who does what you do." 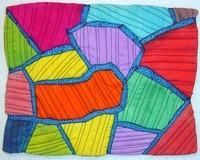 I do not make art quilts the same way that everyone else does and this reaffirms that I am on the right track. What's your favorite art-related quote? When I started this blog in June, I also signed up for Feedburner, a service that collects traffic statistics for my blog's visitors. I really love to see who is stopping in to read my stories. So far, I have had visitors from all over the world, including Malta, Uganda, India, Mexico, Hong Kong, Egypt, the Scandinavian countries, most of Europe (including the U.K.) and lots of people from Canada. My blog is most often translated to Dutch/Flemish and German, but has also been read in Japanese. Hmmm, I wonder what "discombobulated" translates to in Korean? One of the most amusing sections of the traffic stats is where they show me the exact search string someone has used to find my blog. Sometimes, I understand how my site popped up, like when someone searches on "pomegranate jamming", "skinny quilts" or "Clyde Beatty-Cole Brothers Circus". What I don't understand is how others found me, by searching on "how to fold a pocket handerchief" or some guy's name I've never heard of before. Yesterday, someone found my site by searching on "tablecloth French San Diego". I wonder how Google knew I was part French. I frequently get a lot of one-time visitors because they searched on "reasons for being an artist" or "top ten reasons to be an artist". If you google that search string, my post comes up on top. Fancy that! 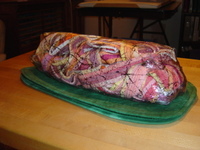 Thanks so much to those of you who leave comments on my blog. I love reading them and enjoy them more than you know. I may not answer every single one, either on the blog or in private, but I always read each comment many times over. Keeping a blog has been a wonderful way for me to document my work process, although lately I feel I've been doing that to the exclusion of my other caregories. Perhaps I should add in a few more organizational tips, old stories or humor pieces, but ideas don't always jump off the top of the shelf and onto my my head when I want them to. If you have any special requests, let me know and I'll suddenly find inspiration. What do you like the most about my blog? Reading about banjo houses and artstrology or do you prefer when I discuss my latest work in process? As I mentally close out the old year, please know how much I appreciate every one of you. Thank you for stopping by. Please come back and visit again. This is how I track exhibition information. 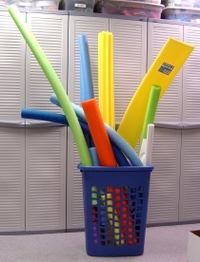 I learn about upcoming juried exhibitions by reading magazines, email lists and websites. Almost all entry forms (prospectuses) can be found online these days, so they are easy to print out. The printed entry forms are filed in a large binder, each one in a page protector and sequenced by deadline date. I write the deadline date on a strip of index card, then slip the card into the front of the page protector so I can see it. If the deadline is a postmark date, I write a little "p" next to the date. At the same time I file the entry forms, I create an index card for each show which lists the show name and location, the deadline and the notification date. I also write any important rules on Post-it notes, using my own shorthand language. For example, "2 years" means that the entries cannot be more than two years old. I always record the dates that the artwork would be away if accepted into the show. I typically add 10 days or so onto each end to allow for shipping. 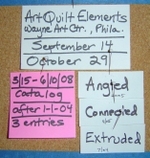 The index cards and the notes are pinned to a cork board in my studio. I divided the board into sections with blue painters tape, so I can change the sections easily without damaging the cork. On my board, the first two lines are used for upcoming exhibits I may want to enter. The third line shows the shows I have already entered and and am awaiting notification. The bottom row has the exhibits to which I'm accepted or otherwise committed. The name of each artwork is written on an index card strip. 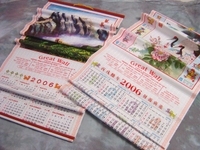 The creation year is also on the front of the card and the dimensions are written on the back. I can easitly sort these cards when deciding what to enter into a show, throwing out works that are too old, the wrong size or are already entered into conflicting shows. The pile that is left helps me choose which pieces to enter. When I am accepted into a show, I replace the show's card with a new one, listing the shipping date, the date of the opening reception and the actual show dates. 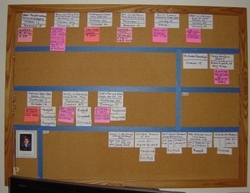 I love this method because it is so hands-on and the cork board is always visible, so I don't forget anything. Changing the cards pinned to the cork board really keeps me aware of deadlines. I just got my rejection letter from Fiber Focus, a biennial exhibit which is held at the Art St. Louis gallery in Missouri. The only time I've gotten into this show was in 2001, with The Light at the End of the Tunnel. 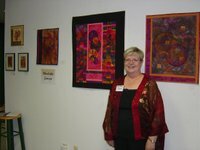 It was one of my very first gallery exhibits when I was making the switch from quilter to artist. 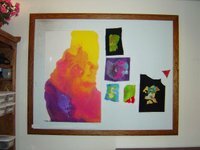 I went to St. Louis for the reception and was amazed at the quality of art exhibited and the attention given to the reception at this regional show. Since then, I have entered some of my best work in this exhibit, but for whatever reasons, I haven't been accepted again. Oh well. I mention this because every time I get my rejection letter from this show, the gallery manager, Robin Hirsch, writes a personal note to me at the bottom. This time, I was so touched that I wrote to her and she sent back the nicest email, even saying that she'd kept up with my work during the intervening time. As an artist, I can't tell you how much it means to have someone remember me and my work. It only took a moment for her to write that note, but the encouragement will keep me going for years. A little kindness goes a long way in a profession where you need to develop a thick skin because of the amount of rejection you get. I usually don't get notes from gallery directors and curators, but I've had just enough things like this happen that I've continued making my art, even during some very difficult times. None of these people had to show these little kindnesses, but with these small gestures, they earned my respect and loyalty and I will continue to enter their shows, even if I don't get in. Artists often view gallery directors as adversaries, but there are some wonderful people who work in this profession and truly care about the people involved. If you know someone like that, be sure to tell them how much you appreciate them. Recently, a former high school classmate looked at my website and wrote to me (twice) telling me she was going to buy one of my artworks. The reunion is now three weeks past and I still haven't heard from her. Then again, I didn't expect to because this happens to artists all the time. People look at our work, tell us they are interested in buying something, then never do. Frankly, I don't blame them. Back in the Middle Ages, a painting or sculpture was a rare and wondrous thing. Few people had the opportunity to see artwork, except in their churches. There were no photographs, television or internet. No billboards or magazines. No YouTube on your cell phone. Today, by comparison, we are bombarded by images all the time and if we don't like one, we can just change the channel and find another one. It doesn't cost anything extra to see something different. In fact, we don't pay for specific images, but for the delivery systems themselves, so the perception develops that individual images don't have any real value. For the same amount you might pay for a painting, you can buy a plasma TV. 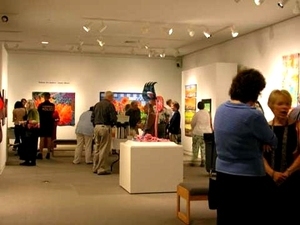 One evening each month, our local art galleries are open in the evening, an event that is becoming popular in many other cities across the country. Hundreds or even thousands of people visit the galleries, drinking the wine, eating the food and looking at the art. However, if you check the signs next to the artworks, you will see very few red dots, indicating that a work has been sold. Many times, you won't find any. The artist has put in years of hard work, paid for more stuff than you could possibly imagine, spent a lot of time and energy hanging and promoting the exhibit, but the people walk through the gallery as if this is a big party for them and everything is completely free. They can always move on to the next gallery and see more art, so why pay lots of money to keep something? It doesn't make sense for anyone to do so. Sadly, there doesn't seem to be an easy solution to this problem. Artists go on making artwork and the rest of the world wants to see it for nothing. So why do we continue putting so much energy and money into making things? The creative urge is strong, but I really wish the art market was, too. 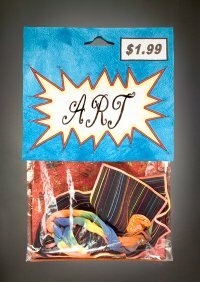 Buy a piece of artwork today! 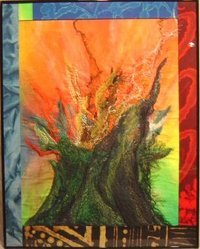 Last night, I was privileged to attend the opening receptions for two art quilt exhibits here in Wichita, Kansas. 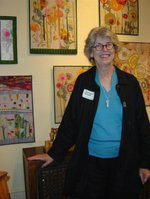 The first exhibit, at Architectural Artifacts, was by Sharon Bass, a talented artist who I know through Kansas Art Quilters. 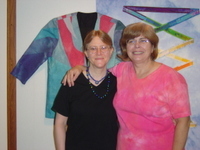 She does beautiful work using silk, sheers and other fabrics. 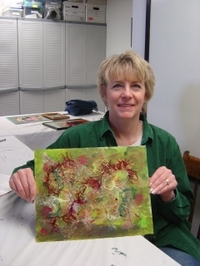 The second artist was Charlotte Janzen, with her exhibit at Artists at Old Town. 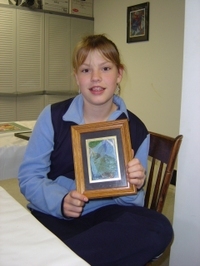 She creates wonderful quilts and is finally blossoming onto the local and national art scene. I have appreciated Charlotte's work for years and couldn't be more happy for her success. As an artist, my secret wish is to discover a brand new color that has never been seen before, but without some help from the Twilight Zone or a superhero mutation, I'm pretty much limited to the same colors that everyone else uses. 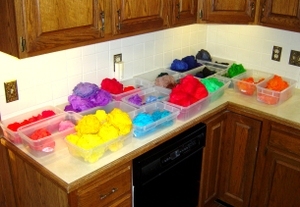 I try not to let that discourage me, so my current mission is to use every color as often as possible. That's why you'll often see so many colors represented in each of my artworks. If you haven't noticed yet (and how could you not), I particularly like working with bright, saturated colors that are the visual equivalent of Habanero sauce, because they practically sear your eyeballs. I have three design walls in my studio and here's how they look right now. Pretty bright, huh? Click on the pictures to see larger versions. The items that are pinned on the walls range from finished pieces that are ready for framing to bits and pieces left over from various projects. In the bottom picture, the smaller pieces were created when I was recently speaking at a guild presentation and demonstrating unusual techniques using fusible materials. The blue/yellow/green quilt top (top picture) was sewn several years ago. It always reminds me of the western Kansas prairie, so if I ever finish it, I plan to call it Greeley County, Kansas. Every so often, I drag this out and intend to add something more to it, but it doesn't seem to want anything else. I haven't made a "normal" quilted wallhanging in a long time, but sometimes you need to listen to the artwork when it's telling you something. 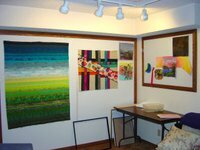 This Memorial weekend, I attended the Studio Art Quilt Associates (SAQA) conference, held in conjunction with the Quilt National opening at the Dairy Barn Arts Center in Athens, Ohio. Here are three very talented artists, Ruth Powers, Del Thomas and Rosemary Claus-Gray at the Saturday luncheon. 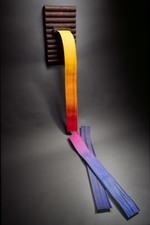 Del is also a collector and owns Discombobulated, my earliest sculptural work. It was the best sale I ever made, as she has also become a friend. 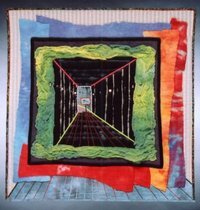 Fortunately, I had the opportunity to see her at the Quilt Visions opening last November, but she was not able to visit me when she drove through Kansas on the way to Ohio. The highway was closed going through the town of Greensburg, KS after it was devastated by a recent tornado. This is my third time attending a SAQA conference and this one was particularly valuable, as it offered a number of marketing-related workshops. The day after I returned home, I went to the bookstore and bought books on search engine optimization, blogging and web design. 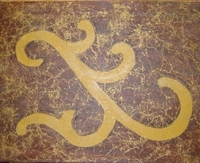 In fact, I began this blog because one of the presenters finally convinced that I needed to create a journal of my art. The best part of the conference was seeing old friends and meeting new ones. 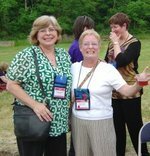 Here I am (in green) with Susan Ferraro. We are at the pizza party, held behind the Dairy Barn. Carolyn Lee Vehslage and Lisa Chipetine are in the background. Just in case one conference was not enough, I spent four days at home then went to Kansas City for a couple of days, visiting the fiber art exhibits associated with the Surface Design Association conference. 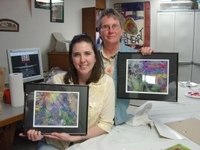 The best exhibits were at the Belger gallery and the H&R Block Artspace, which held the SDA members' show. Not surprisingly, I saw a number of people whom I'd seen just a few days before in Ohio. Thanks to all the volunteers who made each conference so successful.